Feral cat populations began to establish in Australia soon after European arrivals, as early as the 17th century. 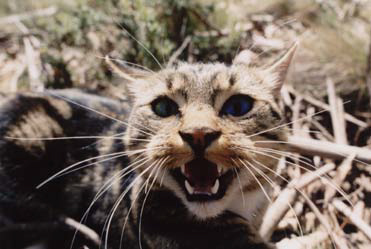 Today, feral cats exist over much of Australia and have successfully colonised most habitats. Impact: Feral cats are skilled hunters and are a threat to the survival of many native species including small mammals, birds, amphibians, fish and reptiles. Competition for prey can also cause a decline in the number of native predatory species such as quolls, eagles, hawks and reptiles. Feral cats are also potential carriers of disease which may be harmful to stock and/or native animals; for example, toxoplasmosis can be transmitted from cats to humans, domestic stock and some native animals. Cats can also carry rabies, which mostly affects members of the dog family but can also be passed to humans, livestock and native animals..